Case Construction Equipment released the Michelin X Tweel SSL All-Terrain (AT) Airless Radial Tires as a factory-approved and supplied option on all skid-steer loader models. The Michelin X Tweel SSL is a single unit, replacing traditional tire, wheel and valve assemblies and eliminating the need for wheel and tire mounting equipment. With no air pressure to maintain once each tire is bolted on, the AT models feature a deep open tread design for excellent cleaning and traction, which allows the core to be retread many times, Case said. 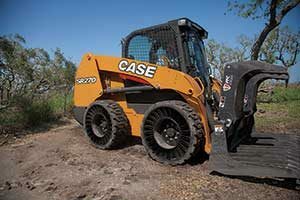 “The addition of airless radial tires to our lineup of factory-available options expands our current offering and shows our commitment to advanced technology, as well as our dedication to providing our customers with a growing array of machine options that can have a positive impact on total cost of ownership,” said George MacIntyre, Case Construction Equipment’s product manager, skid-steer loaders. The airless radial tire provides stability and enables a skid-steer loader to work rapidly with more comfort for the operator, reducing driver fatigue while improving productivity, according to Case. The tire delivers a consistent footprint with a strong wear life, and the design provides lateral stiffness, while resisting damage and absorbing impacts. Additionally, the energy transfer within the high-strength poly-resin spokes reduces the “bounce” associated with pneumatic tires, Case said.